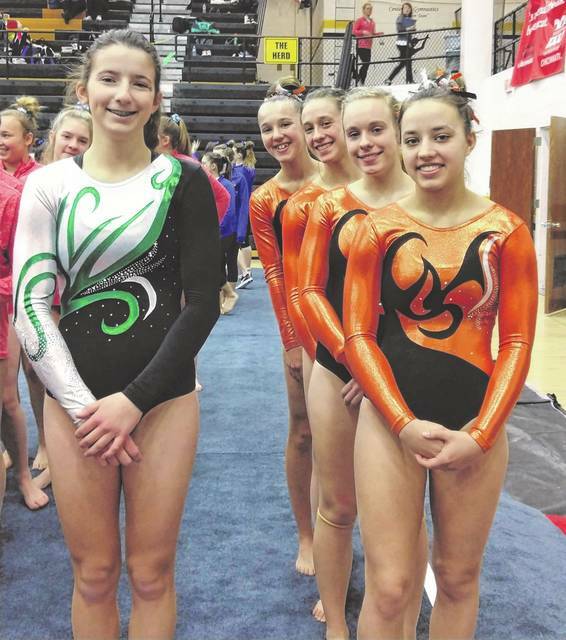 The Versailles gymnastics team finished in second place at the Centerville meet on Saturday. Pictured left to right with their runner-up trophy are Jadyn Barga, Jayla Pothast, Madison Ahrens and Ellie Barga. The Versailles gymnastics team finished second at the Centerville meet on Saturday. Greenville sophomore Emily Marchal (left) also performed well at the meet. Pictured front to back for Versailles are Ellie Barga, Madison Ahrens, Jadyn Barga and Jayla Pothast. 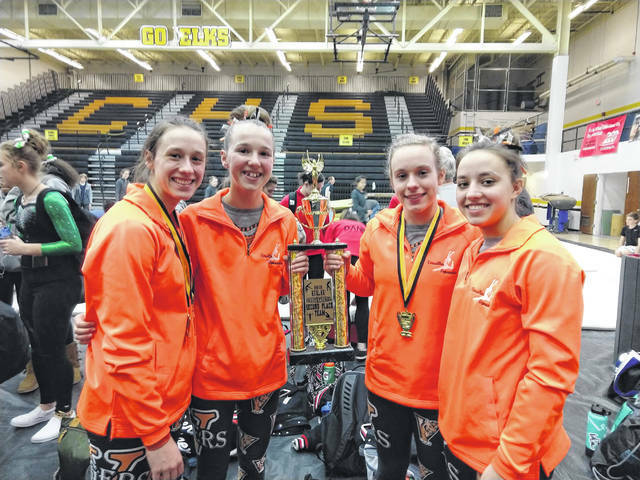 The Versailles gymnastics team competed in the biggest meet of the season and finished as runners-up on Saturday out of 15 teams at Centerville. The Lady Tigers earned a score of 133 coming in just behind champion Miamisburg with a score of 138.8. Jadyn Barga had great meet including finishing first in the All-Around, first on Vault, second on uneven bars and fourth on Floor. She also improved her performance on Beam. Ellie Barga had improvements on all events taking second in Beam, fifth in Floor and finishing fourth All-Around. Madison Ahrens improved on Bars, Beam and All Around. She placed fifth on Vault, sixth on Floor and finished as sixth All-Around. Jayla Pothast had a good meet with improvement on Beam. Greenville sophomore Emily Marchal had an improving meet as well. On the bars, she improved .90 and on Floor 1.80 points. Her All-Around score also increased by .40. Schools competing at the meet included Alter, Anderson, Beavercreek, Centerville, Cincinnati Country Day, Kings, Miamisburg, Miami Trace, Northmont, Oak Hills, Sycamore, Troy, Turpin, Versailles, Worthington Kilbourne. There were some individuals who competed as well including Arcanum, Batavia, Blanchester, Greeneview, Greenville and Washington Courthouse. Versailles next competition is a small Quad meet this Thursday, Jan. 31 at the Flying J’s Gymnastics, 7546 State Route 242, Versailles. March in begins at 5:45 p.m.